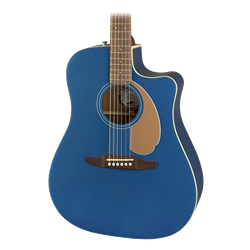 PLAY SOMETHING DIFFERENT Bold and brash, the chest-thumping sound of this big-bodied acoustic was designed to inspire from the moment you pick it up. The exclusive slope-shouldered Redondo body shape has a rich, commanding voice that fills any room. The gloss metallic top, back and sides, as well as a matching painted 6-in-line headstock and crème binding, give it a shot of electrifying attitude. Dynamic, unique and unconventional—like today’s guitarists—the Redondo Player refuses to be bound by the past. The same no-compromise attitude that gives the Redondo Player its uniquely killer vibe extends to every aspect of its construction. It features optimized bracing for reduced mass and superior resonance, a Graph Tech® NuBone® nut and saddle for greater sustain and a Fishman® preamp system that makes it easy to plug in without sacrificing the guitar's natural sound. Its lightweight mahogany neck features a comfortable, easy-to-play, slim-taper "C"-shaped profile suitable for any playing style and its walnut fingerboard and bridge further augment its vibrant tone. With superb playability, distinctive looks and unmistakably Fender vibe, the Redondo Player is an inspiring instrument that was made for self-expression. FEATURES Fender-exclusive Redondo body shape Painted solid spruce top; painted mahogany back and sides Fishman pickup/preamp system Matching painted 6-in-line headstock Mahogany neck with slim-taper "C"-shaped profile; walnut fingerboard and bridge BODY Body Back Mahogany Body Sides Mahogany Body Top Solid Sitka Spruce Body Finish Gloss Poly Body Shape Redondo Body Binding Aged White Bracing Scalloped X Rosette 2-ring B/W/B NECK Neck Material Mahogany Neck Finish Satin Urethane Neck Shape Slim "C" Scale Length 25.6" (650 mm) Fingerboard Material Walnut Fingerboard Radius 15.75" (400 mm) Number of Frets 20 Nut Material Graph Tech® NuBone Nut Width 1.69" (43 mm) Position Inlays Dot ELECTRONICS Controls Volume, Bass, Treble HARDWARE Bridge Modern Viking Bridge Pins Aged with Black Dots Hardware Finish Chrome Tuning Machines Sealed Nickel Pickguard 3-Ply Gold MISCELLANEOUS Strings Fender® Dura-Tone® Coated 80/20 Bronze (.012-.052 Gauge) Legal Notice WARNING: Cancer and Reproductive Harm - www.P65Warnings.ca.gov.